In this tutorial I’ll show how you can make a SOAP call from a Drupal page callback using the nusoap library. 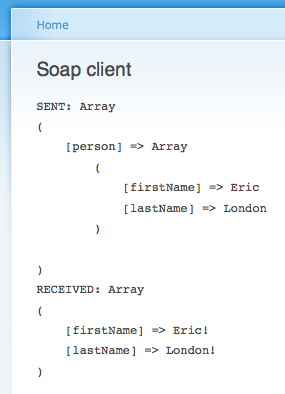 For this example I decided to create a sample soap server instance for testing purposes. I created the following directory structure for my new module: sites/all/modules/custom/nusoap/. I then download the nusoap library (nusoap-0.7.3.zip), extracted the archive, and put the “lib” folder in my module directory (sites/all/modules/custom/nusoap/lib). 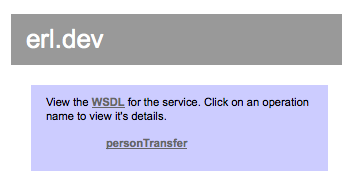 Clicking on the WSDL link will show my automatically generated WSDL/XML; clicking on the method name “personTransfer” will show more details about the soap server method. Thanks nusoap! Browsing to the new page callback (ex: http://drupal.erl.dev/soap-client) shows the following debug output. sweet.